Blackberries are a great fruit for making jam. Making your own jam allows you to enjoy blackberries throughout the year. 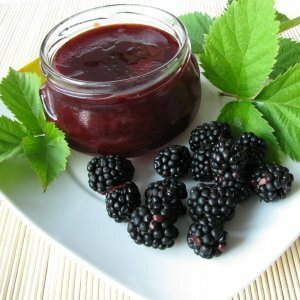 This page contains blackberry jam recipes. I wanted to make homemade jam this winter, so I purchased some frozen berries from the farmers market and came up with this recipe. It's a nice sweet/tart combination. If berries/fruit are frozen then you can defrost them but there is no need for them to be entirely defrosted. Add rhubarb in a large pot with water. Boil for about 5 minutes until tender. Crush blackberries, then add to rhubarb with lemon juice and pectin, stir. Bring to a boil and boil for 2 minutes. Add sugar 1 cup at a time and stir. Bring to a boil then boil for 1 minute. Process in hot water bath for 5-8 mins. I had to do my blackberry jelly over again. I don't think it is going to take again. Can I redo it? If yes, do I do it the same way or some other way? Did you use pectin? If so it can take up to a week to set up. I don't know how to advise you, how long has it been maybe just wait a bit and see what happens. I made Blackberry Jelly and did not use pectin, I put my berries through a juicer along with two granny smith apples measured the juice and added equal amounts of sugar and 1/4 cup of lemon juice. Then I boiled it until it had reduced by 1/3. I bottled it and BWB it for 10 minuted. I like to not use commerical pectin if I can get away with out it. If you are not using pectin (Certo or some other brand), please get some and use it. Having to make your jam or jelly over again several times is a nuisance. Pectin is a totally natural product made from apples. It makes wonderful jams and jellys, and if you follow the directions, you get a perfect product. PLEASE follow the directions and use the correct amount of sugar and fruit as well. If you are concerned about the high sugar content, there is a pectin product that you can get that uses artificial sweetner, which is good for people who have diabetes. An added advantage of pectin is that you do not have to reduce anything. You get more jam out of the same amount of fruit. If you are using pectin, you will likely find a website or toll free number on the directions or on the box that you can phone to troubleshoot the problem. However, I find among my friends, that the only people who have trouble are those who do not follow the directions. I have not used blackberries, but the directions for raspberry jam are the same on the all the pectin boxes. I prefer Certo liquid, but I am sure that they all good products. Several years ago, I made mulberry jelly that didn't jell. I didn't want to re-do, it so my husband and I just had delicious mulberry syrup for our pancakes. YUM! I was thinking of a topping for ice cream as opposed to redoing it. And with another, I had a misgel a few years ago. It wasn't too bad, so I let it sit on the shelf for a few months. When I realized I forgot it was there, it was fine. Only bad thing is that I was stuck with labels that read "misgel" :( so I couldn't exactly give them as gifts. I recently read that to redo a jelly you can boil 1 to 1 and a half cups of water with a fresh box of Certo Light in a small saucepan at medium heat, boil hard for one minute stirring constantly and set it aside. In another pot, reheat your syrup (failed jelly) to a boil, add your missing fruit or sugar, add your set aside pectin mixture, boil for 30 seconds and pour back into prepared jars. There is a new pectin out by Bernardin called "No Sugar needed " Fruit Pectin that is very good for successful jelly and jam. I have some chokecherry/crab apple syrup because I used the wrong pectin for reduced sugar. I do, however, like to keep lots of syrup for on waffles, pancakes, French toast and ice cream. I am always "reluctant" to redo a job. I'd rather make fresh jelly and try to use up the syrup another way. By the way, I have never tasted blackberries until last summer when I bought a basket of them off of a fruit truck - wow! They were delicious! Our near by Qu'Applelle Valley has lots of chokecherries that we can pick for free that my family will not let me run out of. As I speak I have several frozen containers of the cooked chokecherry juice and crab apple juice set out to make a few pots of jelly. Lol. We are presently using our last jar. My family, more specifically, one son would be devastated if I actually ran out of Chokecherry - Crab apple jelly. Thank you, Susan. I did get a lot of useful feed back, and am glad I found your site. Thanks again. Happy fall to you. Apples contain quite a lot of pectin which is why you don't need to use commercial pectin. I am looking for recipes for blackberry jam and pies or tarts. Mmmm....lucky you. For jam you need pectin and recipes are in the box for jam, jelly, and freezer jam. I came up with a blackberry pie recipe, and when I lived where berries grew abundantly, we went through many of these pies. 1 cup of crumble mix and sprinkle over pie. Look at it, add some more if you think it looks too bare. Will use about 1/2 to 2/3 of the mix. Save rest in jar in fridge for another pie. Bake at 375-400 degrees until crust is brown, filling is bubbled and thickened. The flour in the topping helps thicken as well as the cornstarch. If you are making a regular pie with two crusts, add more sugar to filling and 1-2 more tablespoons cornstarch. You can always add a squirt of lemon juice to the berries if you like it. Adds a bit of tartness if berries are past their prime. Not needed if perfect berries. You decide what's perfect for you. This is sort of a berry tart. We just like crumble topping. Can use it on any fruit pie. Plum, cherry, apple, are good with it. When one is a new cook, just try to imagine if it sounds like it would taste good. Choose your recipes on your skill level and your taste buds. Sometimes, you want to be able to make jam without storebought pectin. 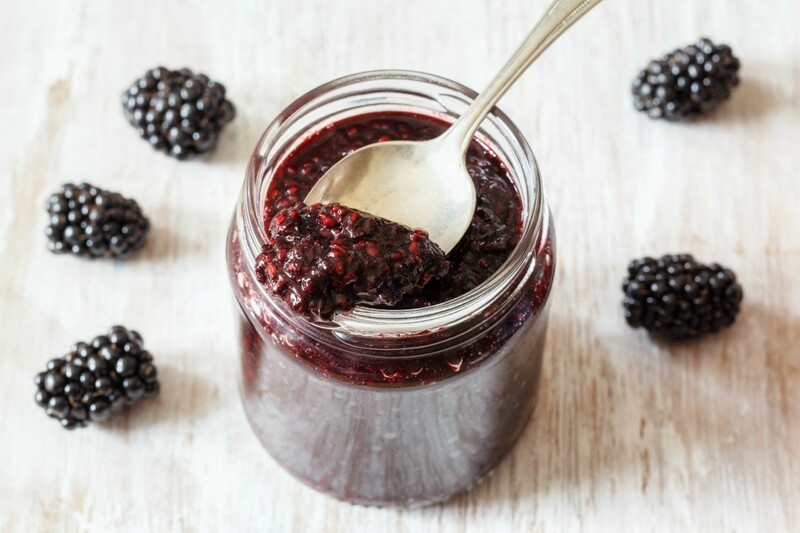 This is a guide about making blackberry jam without pectin.